This photograph was taken in early July. 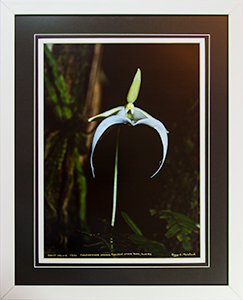 Ghost Orchids bloom in the Florida wet season and the peak of mosquito season. We were wading in water just below our waist. Tanin in the water makes water visibility almost zero. With her camera equipment just inches from the water surface, Nancy couldn't afford to trip over the abundant cypress knees or step in a solution hole. Water moccassins and alligators were also well represented. Dendrophylax lindenii, which is in the Vandeae family, is a leafless perennial epiphyte native to Florida, Cuba, and the Bahamas. Photosynthesis is carried out in the roots that radiate from the base. It is found in swampy forests and seems to prefer growing on pond apple trees. It is endangered, with only about 2,000 remaining in Florida. 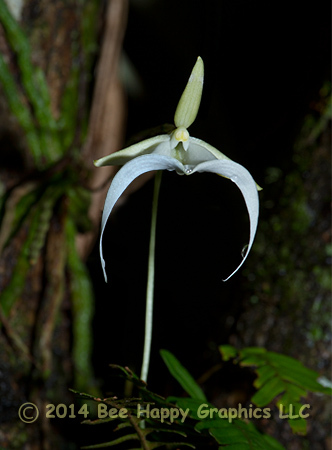 Cultivation is nearly impossible, and wild-caught orchids die within a year (and yet it suffers from heavy poaching). It requires a symbiotic relationship with a certain type of fungus that helps it gather nutrients in exchange for sugars. 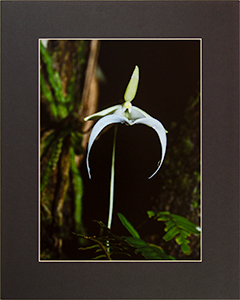 The Ghost Orchid does not flower reliably. It is pollinated at night by the giant sphinx moth, the only insect with a long enough proboscis. The larvae of the giant sphinx moth feed on pond apple. Nancy Wins Award In F.W.F. Photo Contest. Photographic details: Canon EOS 7D camera w/ EF 100-400mm f/4.5-5.6L IS USM lens set at 400mm. Off-camera flash was used. Camera was on f/11 for 1/180 sec at ISO 100. Fine Art Paper 19" x 14" 25" x 18"